Waaaaaaay back in 2007, I posted about Turkey Art that the kids and I made. And she reminded me of things that even I’d forgotten that I’d written! When I saw this picture on her facebook page, it looked familiar. I love that Christy and her family wrote different things they were thankful for on the feathers. since I’m sure the kids don’t remember doing it! I already have the bamboo skewers and paper! I am totally stealing this idea… I can’t wait… I have some pumpkins in my yard… LOL i bought bunches for the pumpkin patch (halloween party) and I have a few left… I will have to make sure they are still firm though. if they are still good i can drop it by on my way to gray this afternoon. I loved the idea!! We had such fun. I don’t think my 12, 14, and 16 year old step children have ever done much crafty stuff before, and I figured they’d hate it…but they had such fun!! I’ve got everything from Lady Gaga and cheesecake to Jesus and the military on that pumpkin! Tristan drew the face himself. Thank you for the inspiration!! Oh my goodness! I have bamboo skewers, construction paper — and two pumpkins sitting on my porch. I also have an easy cooking day tomorrow by comparison because it’s just the four of us — so, there will be time for crafty fun. Thanks for this! We need a centerpiece for our table and have pumpkins AND skewers! Amazing that I have everything we need to make it! I think we might just give it a go! So cute! That is so cute! I’ll have to try and remember that next year! 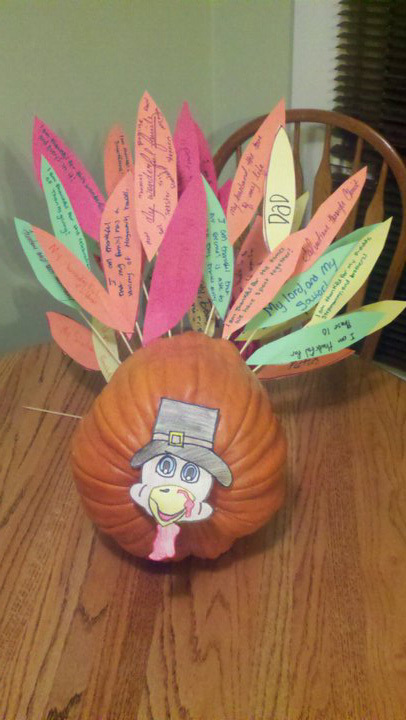 I also love the idea of writing what you’re thankful for on the feathers! This post also reminded me of a craft Punkin made last year at school. I did a post on that too… though I think it was on the old blog. I should find it and bring it over to the new one sometime. We did something similar. I collected branches from the yard and we wrote things we’re thankful for on construction paper “leaves” and made a Thanksgiving Tree. I had big plans to do something like this this year, but it failed. What I am going to do is put out a glass jar with small bits of paper next to it and let the girls write on the paper things that they love, that make them thankful, things that remind them of the spirit of the season. We will read them on Christmas.